I am wanting to but train tickets for a train which only has unreserved places/tickets so i can not buy them online through cleartrip for example. So i need to buy them in person at the train station, do i have to buy them on the day or can i purchase the day before. If my train departs at 8:00am for example, when is the earliest i can get the tickets/how early would i need to get to the train station? it might be worth putting what date and train you are getting. People on here may be able to give you some idea how busy that train may be-eg if your travelling during the Puja/Diwali period when there is much higher volume of passengers. Only unreserved tickets are available for local trains.. Almost every other train, even passenger trains would have a provision for some reserved tickets..
For local trains, the journey has to be started within 1 hr of purchasing the tickets and the return journey (if you purchase a return ticket) has to be done within 24 hours..
Be at the station atleast 2 hours prior to departure time. Snotty the OP is talking about a passenger train where the entire train is unreserved and can not be booked online. Hmm.. I thought there were some reserved tickets even in all the passenger trains (many of the ones that I have had to travel at times have had some reservations seats).. Maybe the OP can specify what he is looking for.. Yes sorry it is a local train, from Agra Fort to Fatehpur Sikri. Only unreserved tickets available for it. If I were you I would get to the station about an hour before your train is due. Bigger stations have a separate window or windows for Unreserved tickets. I don't know Agra Fort station so I'm not sure whether it has separate windows. Sometimes the Unreserved window does not open until about 30 minutes before the train is due. If you are going for the 8 a.m. train it starts at Agra Fort so you may be able to board straight away. Indian Railways allow the purchase of an unreserved ticket three days prior to the date of journey. That is the theory but in practice I was turned down when I tried to buy tickets for the following day at Phalodi. Unreserved tickets can be purchased 3 days in advance but only if the distance is greater than 200kms. Read this above a ticket counter at the Bellary station recently. Not sure about this, need to check it.. Usually windows are open well before, not related to the train timings..
And at times the queues are so horrible long that even if you wait for more than 1 hour, you are not sure, your number will come (usually in the bigger stations)..
Local train travelers however have the advantage of usually having a separate window where other unreserved tickets are not issued.. 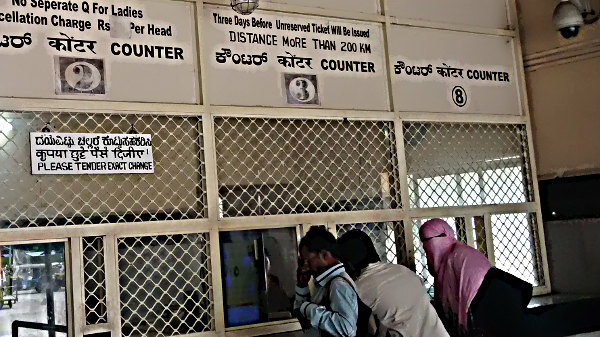 Since most of the local trains ticket counters are computerized now, one can take a unreserved ticket from the local train ticket counter. I have seen people taking tickets for Jalgaon, Nagpur from local train ticket counters. On two of the three occasions that I have bought a non-Suburban Unreserved ticket the appropriate window did not open until about 30 minutes before train time. The stations were both quite small - Phalodi and Orccha.